In our Schools Unbranded Action Kit, you'll find valuable information to help you understand the challenge of children's exposure to excessive commercialism at school. 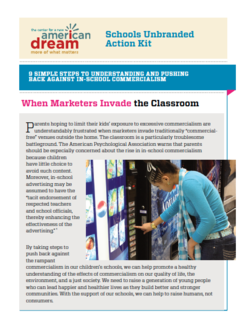 You'll also find a step-by-step guide to help you design and execute a campaign to push back against excessive advertising in the classroom. By taking action to combat the rampant commercialism in our children’s schools, we can help promote a healthy understanding of the effects of commercialism on our quality of life, the environment, and a just society.